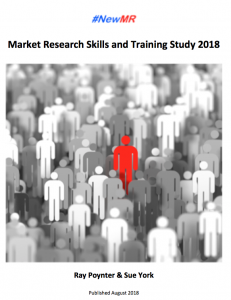 Below is the Executive Summary of our Market Research Skills and Training Study 2018 Report. You can download the full report by clicking here. Market research is a knowledge-based industry, its key asset is people – software comes and goes, techniques evolve, but if the future of market research is to be secured, it will be on the strength of its people to add value, and importantly, to add value that non-researchers cannot. To ensure that value-added future, market research needs to develop its people, and a key part of that process in training, to build the competence of the people who make up the research industry. However, this report suggests that too little training is happening. The authors believe that if market research and the insights profession is to prosper in the upcoming world of big data, automation, and artificial intelligence, this must change, and we will outline some of the key steps needed to achieve that. This report is based on a study conducted globally in April to June 2018, with 1108 market researchers and insight professionals, and builds on our Market Research Knowledge Benchmarking Study 2017. Visit for a copy of this report and other project details. The project was run by NewMR’s Sue York and Ray Poynter and supported by a wide range of people, to whom we offer our thanks, and who are listed in the full report. The main story is that too many market researchers are not getting the training that they (and the industry) need to be receiving. 39% receive less than 6 hours training a year. Only 18% receive 6 or more days a year. Our recommendation is that (in most cases) the minimum level of training should be three days per year. This is in many ways a modest figure, but it is more than two-thirds of people working in market research are receiving at the moment. The rest of the key findings build on this main story, as indeed does the rest of the report. There are details and good points and bad points, but the main story is that too many market researchers are not receiving enough training, something we which believe is endangering the future of market research as a knowledge-based, value-adding industry and profession. One quick way to find out if your staff or colleagues are receiving enough training is to ask them. Our study indicates that when people say they are not receiving enough training, or that they are unsure whether they are receiving enough training, they are right in about 75% to 85% of cases. Let me be a devils advocate. If people are not being trained appropriately in market research, why not farm it out to professionals and manage the budget and project manage? Looking forward to reading the full report. Farming out the training to third-parties is a common and sensibe part of the solution. However, this still requires a) budget, and b) putting space into people’s workday for learning. Thanks Ray For Sharing great information …..
Hi Ray, Just a suggestion – while the content of your reports is good, it is not at all visually appealing. I suggest you to look at that aspect too.